Traveling cat spotted in Statesville, NC, USA. 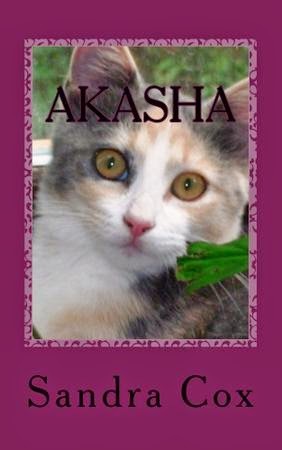 This cat was the cover model for AKASHA by Sandra Cox, a novel about a calico kitty who journeys back to earth to save the kitten left behind. What a sweet face and good luck to all those entering the giveaway. Have a fabulous Friday. Good luck everyone! 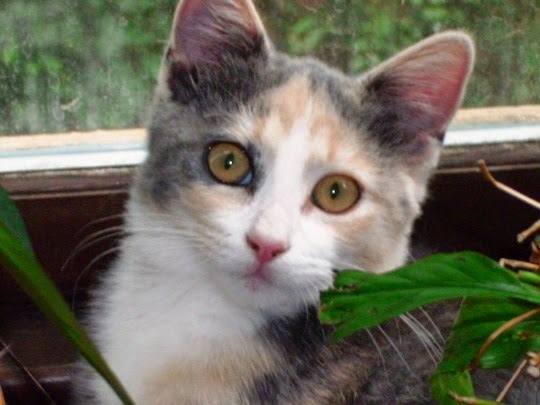 Beautiful kitty! Another sad story, they seem to abound today. I cannot understand how anyone could drown kittens. This does sound like a good premise for a book though. Adorable kitty. I hope she fulfills her quest. Happy Friday! Cheers!! Une jolie frimousse pour illustrer ce livre. Bonne idée ce jeu pour faire connaître "Traveling cats", c'est une idée généreuse de la part de Sandra Cox. Dommage, mais c'est comme cela ..
Ce que chat est beau et expressif ! Il est parlant. Ou elle. Awe, love the cover and the kitty just made me smile. TGIF and have a fabulous weekend! What a cute kitty! The novel sounds interesting! Very cute cover model and the book sounds very interesting. We only have dogs here right now but still like to visit all pet blogs. We are not going to enter the contest so someone who can use the cat toys wins. Good luck to all entering! So precious! I love those eyes!